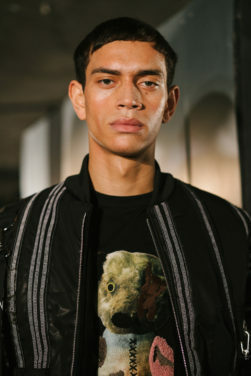 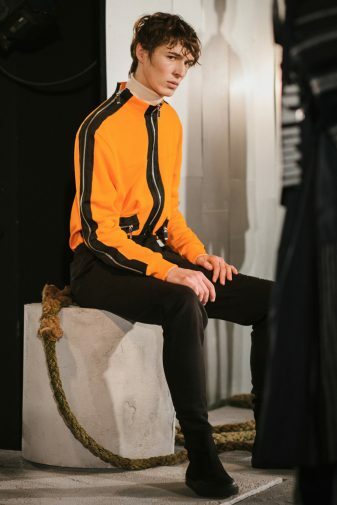 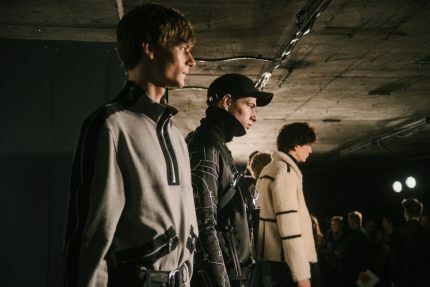 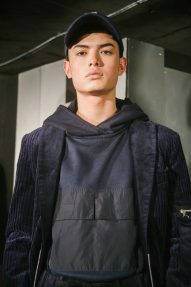 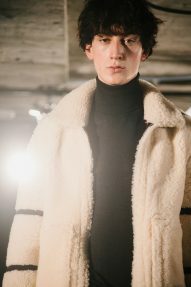 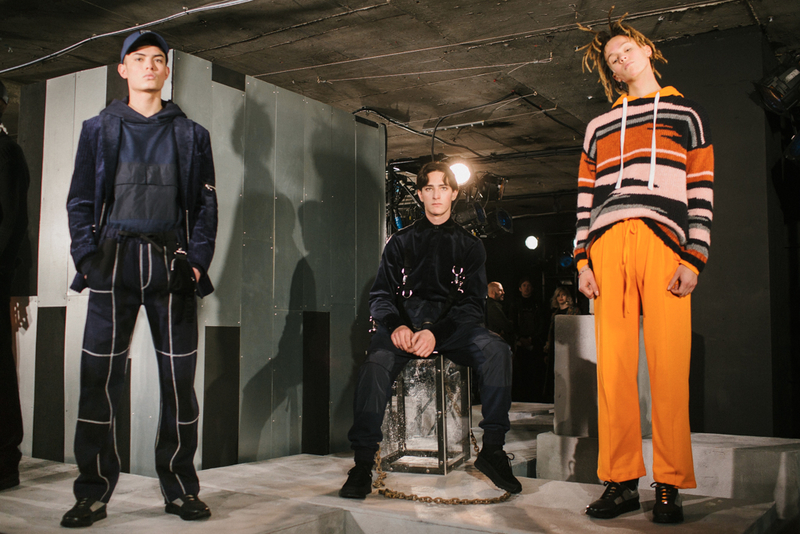 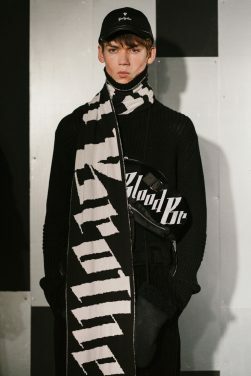 Blood Brother brought their autumn/winter collection to the final day of London Fashion Week Men’s with an edgy presentation. 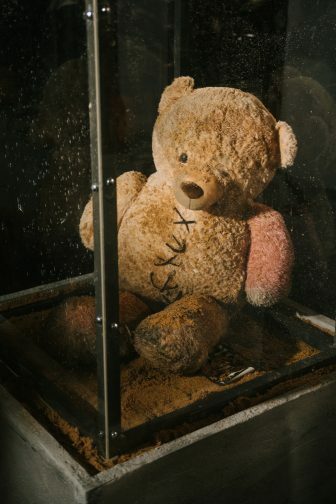 A giant fairground teddy and florescent road bollards sat abandoned in glass boxes while grim faced models posed atop concrete blocks. 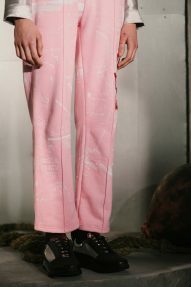 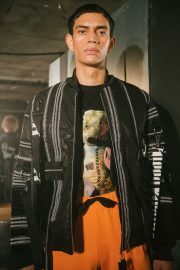 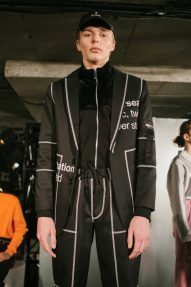 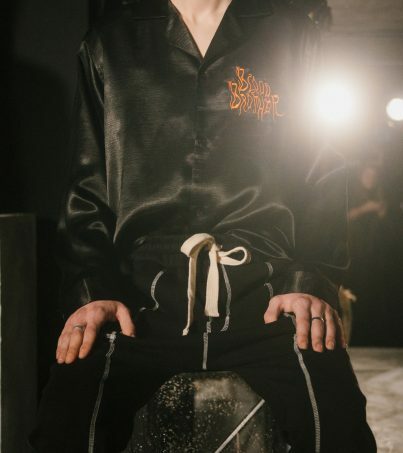 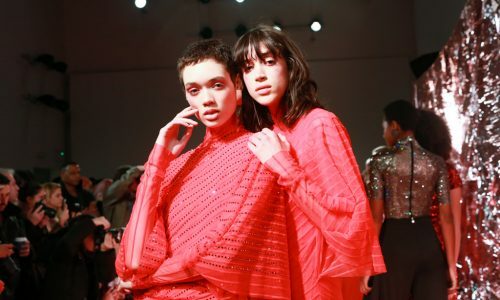 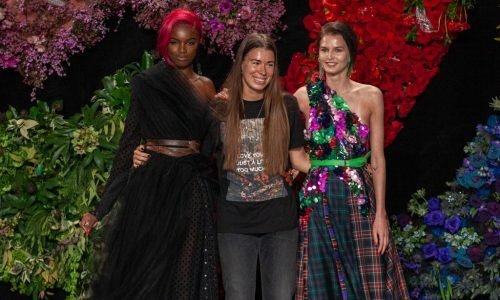 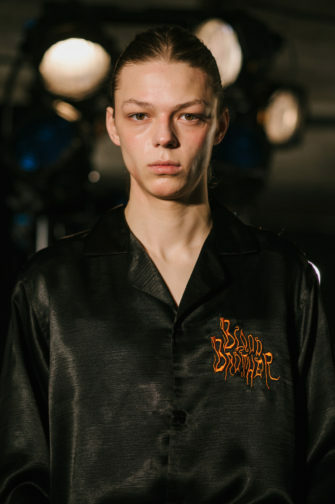 Unapologetically contradictory, signature oversized urban jackets and bombers were presented next to pink silk pyjama-like trousers with Blood Brother embroidered in red-horror-style lettering, aggression and delicacy becoming unusual bedfellows. 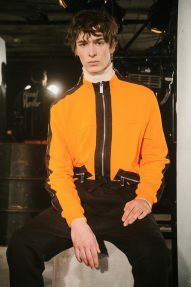 Prints incorporated cartography of the river and bright oranges dispelled a largely dark palette. 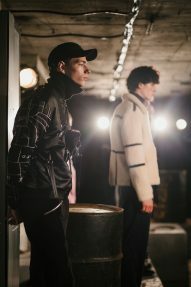 Sporty grey joggers and white Blood Brother lettering on black hoodies were more distinctly urban while tailored silk and corduroy suit jackets paired contrastingly with caps played upon the diverse characteristics of contemporary city-folk. 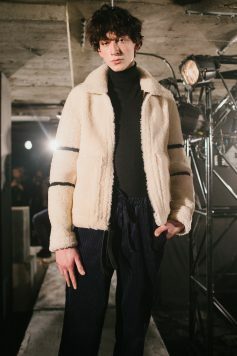 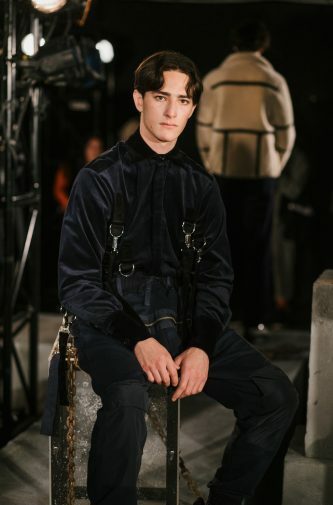 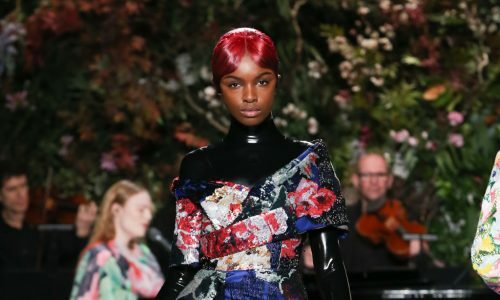 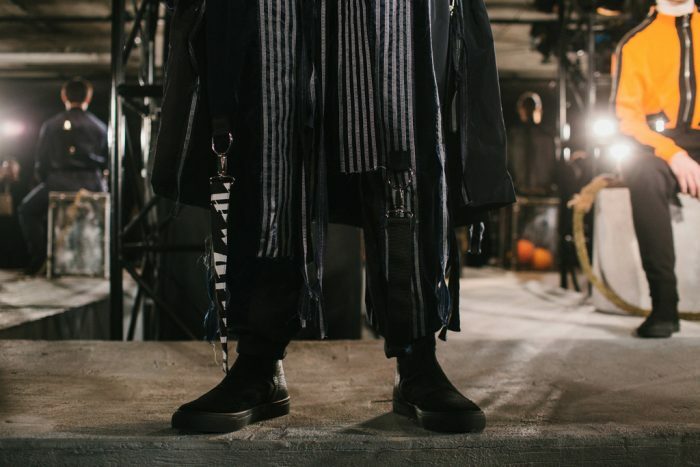 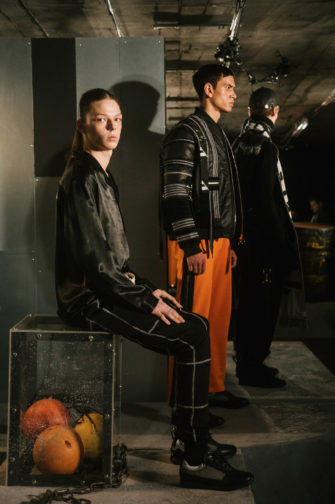 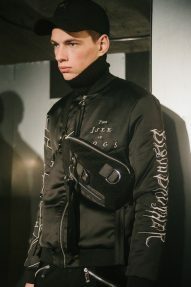 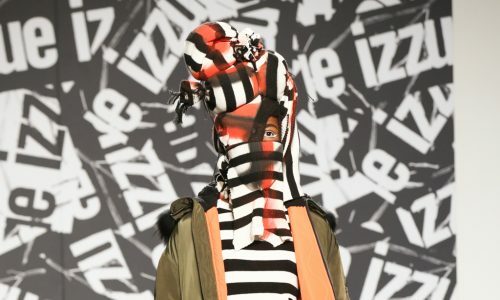 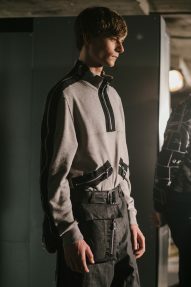 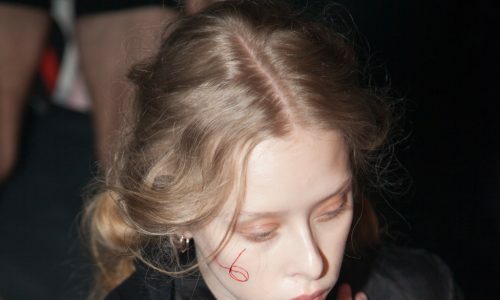 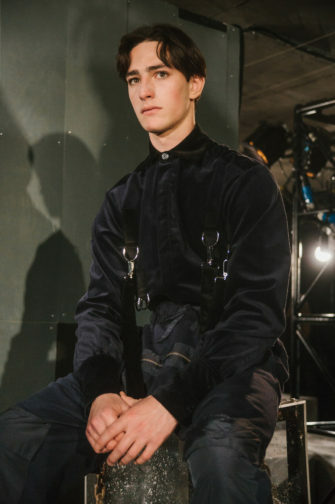 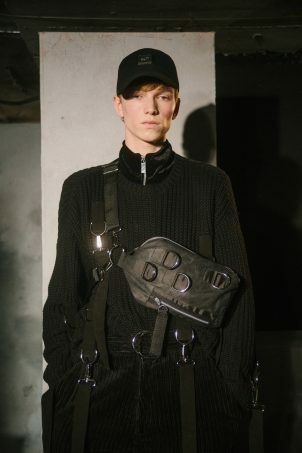 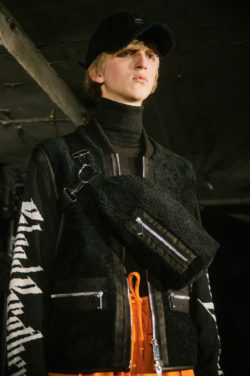 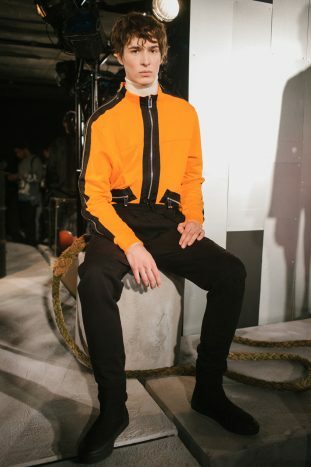 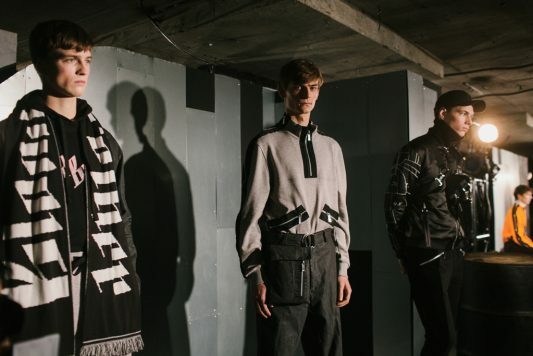 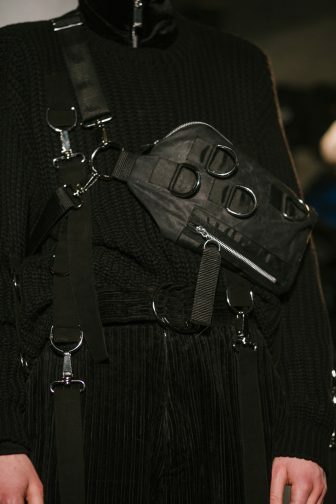 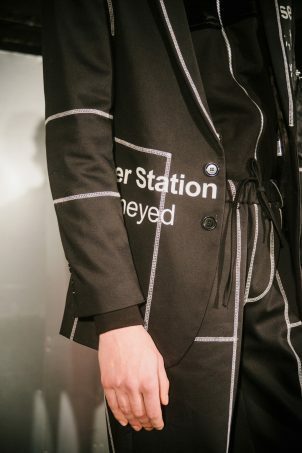 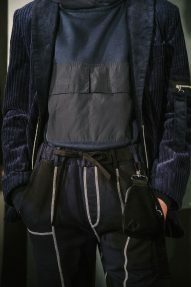 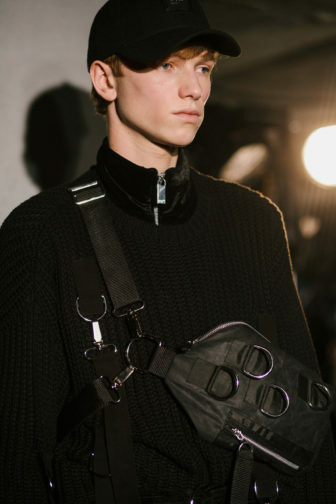 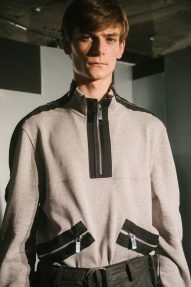 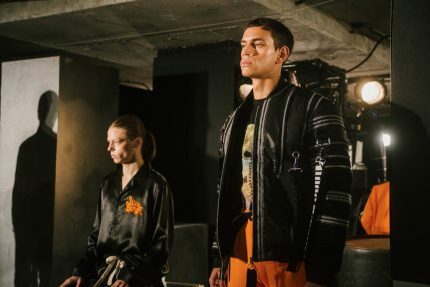 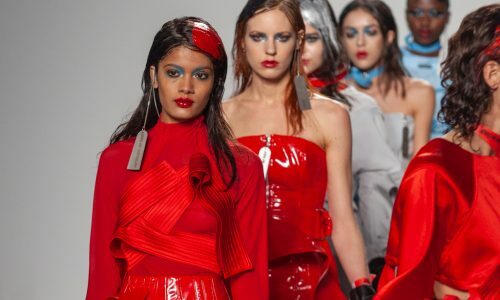 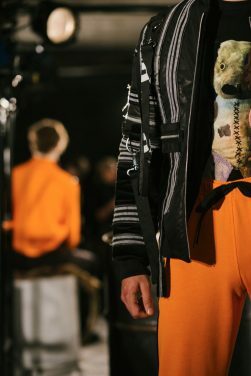 Exaggerated use of superfluous buckles and straps and waterproof-look waxed cotton alluded to men at work and the re-launch of an accessories collection brought logoed scarves and utilitarian cross-body bags. 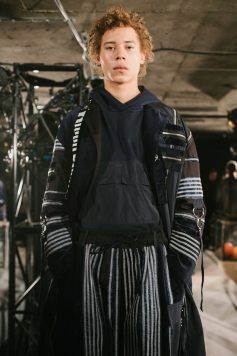 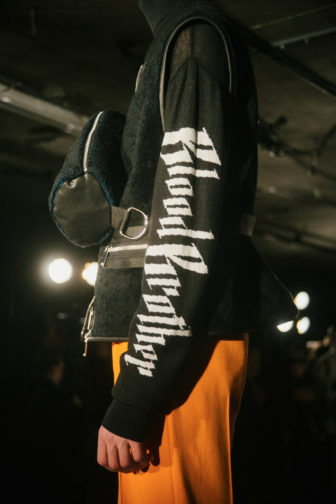 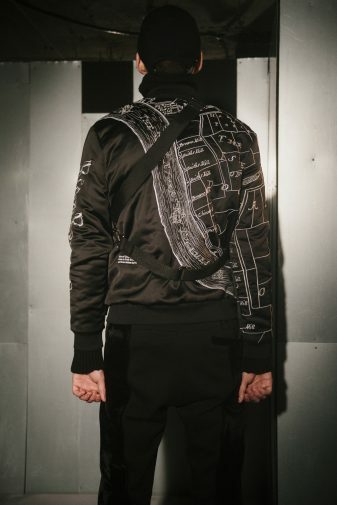 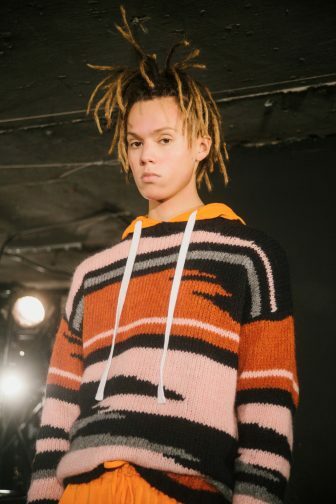 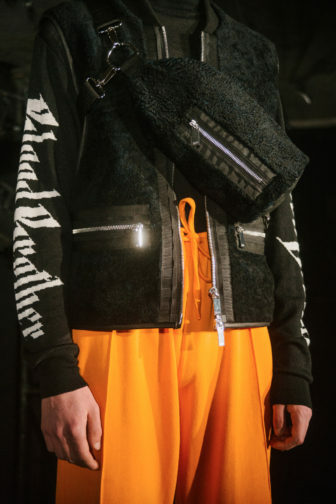 Blood Brother demonstrated a cutting-edge approach to contemporary style, showcasing a fusion of their signature styles and fresh designs imaginatively sourced from all that the Thames, the city’s life-blood, represents.